The University of Minnesota APWA Student Chapter is proud to share that we are making strides with increased membership and momentum building behind a new officer group this spring. 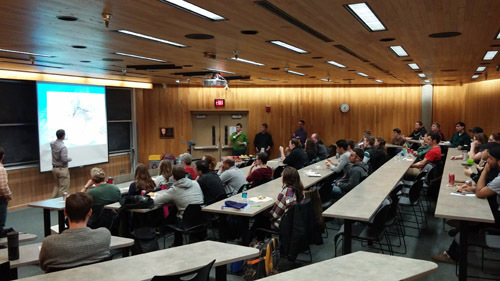 At the first organized event of the semester, nearly 40 students heard five APWA-MN professionals share their day-to-day activities, as well as some helpful career advice. Feedback from students on the networking opportunities provided by our chapter has been highly positive. With the help of our four professional advisors -- Nick Egger, Justin Messner, Mitchell Hoeft, and Jacob Guzik -- the University of Minnesota Student Chapter officers have established short- and long-term goals for sustaining active student involvement in APWA-MN. The first of these goals is to inform students of the meaning, importance, and job opportunities available in public works. Through the recruiting process, we as officers continue to find that students don’t consider their civil engineering emphasis to fall under the category of public works. As a result, it seems that many students don’t seek employment in the private or public sectors of public works simply from a lack of information provided in school. Membership is increasing! Student chapter officers have been busy with recruiting efforts aimed particularly at gaining younger students in the chapter. Much of the momentum present in the chapter right now is a result of officers that became members as sophomores or early junior undergraduates. Joining earlier in our college experience has allowed us all to take advantage of several networking opportunities that have led directly to internship opportunities. This network building has been highly beneficial, and is something we highlight in every effort to recruit new members. In order to promote consistent membership each year, the student chapter has also started setting some long-term goals. Scheduling regular yearly events such as our recent networking event is one such example. We believe that holding annual events will increase our recognition, improve turnout to events, and allow for more efficient scheduling. Another long-term goal for the student chapter is to improve and assist in the transition of new officer groups. Current officers have recognized the challenge in becoming familiarized with APWA-MN while also trying to grow membership with organized events. Increasing structure as well as membership carry-over each year of younger students encompasses our main long-term objectives. The student chapter greatly appreciates the continued support of all the professional members who have made our events possible. We look forward to continued success in developing our student chapter and hope to interact with many more professionals along the way. With all five officers currently employed in public works related internships, our motivation to promote the field is strong. This motivation has not only developed our own commitment to public works careers, but has also extended our efforts to promoting others in joining us to make the next generation of public works a successful one.